You need never be without a scale bar again! The above figure, from Archibald et al. 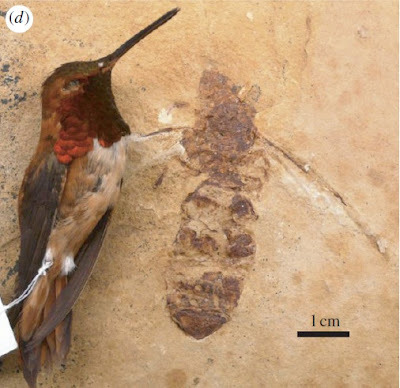 (2011), shows a rufous hummingbird Selasphorus rufus alongside the newly described early Eocene giant ant Titanomyrma lubei. This fossil comes from the American Green River Formation, in present-day Wyoming. At 51 mm in length, this is one of the largest known ants, rivalled in the modern fauna only by the marginally longer but possibly less robust driver ant Dorylus wilverthi (I wrote about driver ants in an earlier post). The title of largest ant ever goes, so far as we know, to Titanomyrma giganteum (or Formicium giganteum*) from the Messel Formation of Germany. *There's a bit of skullduggery in Archibald et al. 's paper viz. the relative status of the pre-existing genus Formicium and their new genus Titanomyrma, whereby Titanomyrma is not diagnostically different from Formicium, but Formicium is relegated to the status of a form taxon for wing fossils only. This is all above board, ICZN-wise, but I'm not sure I'd condone it. 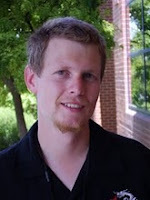 Living giant ants (which, except for Dorylus, are all under 35 mm) are mostly tropical in distribution, but the locality from which Titanomyrma lubei hails would have been within the Arctic Circle when it was alive (Update: Neil has corrected me: the Green River Formation was not Arctic, but northern temperate). The Eocene was a much seamier time than today and, though not tropical, the Arctic would have been far from a frozen wasteland. Archibald, S. B., K. R. Johnson, K. W. Mathewes & D. R. Greenwood. 2011. Intercontinental dispersal of giant thermophilic ants across the Arctic during early Eocene hyperthermals. Proceedings of the Royal Society of London Series B—Biological Sciences 278 (1725): 3679-3686. Are ant wings generally not diagnostic at genus/species level? See, I would have thought they would be, at least at some level, but the authors of this paper regard them as more variable. 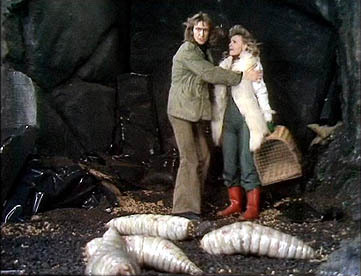 They do refer to a broad-scale review of Formiciinae (the subfamily containing Formicium and Titanomyrma) currently underway but not yet published, so I suppose that might affect things. I personally would have probably just left everything as Formicium until there was anything to really indicate otherwise, but I'm not the one looking at the actual specimens. "but the locality from which Titanomyrma lubei hails would have been within the Arctic Circle when it was alive." That doesn't sound right. When I was working in the GRF the thinking was that the Eocene paleolatitude was just a tich north of 45 N. Taking a quick glance at Archibald it looks like they are posting a tran-arctic dispersal to explain the fossil distribution, but not that this particular fossil was above the arctic circle. Ah, thank you for correcting my misunderstanding. Still, quite a bit further north than the tropics. Hummingbird might also be the appropriate scale for extant termite queens after they enlarge: I've seen some in collections that are about 3 inches long. And of course there are plenty of extant flying insects that are much larger. I've caught Pantopthalmids that large, and many beetles, Belostomatids, robber flies, walking sticks and sphinx moths are bigger still.